Basically, there are 7 Types of Power in the Workplace. Let's use "School" as an example. 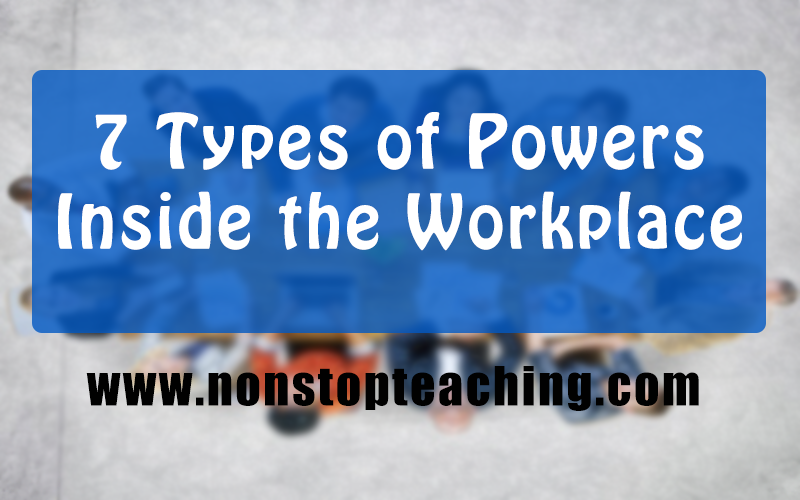 These types of powers can be use to define you as one of the personnel in the workplace. 1. Legitimate Power is where a person in a higher position has control over people in a lower position in an organization. 2. Coercive Power is where a person leads threats and force. It is unlikely to win respect and loyalty from employees for long. Example: The teacher forces his students to do their homework or else he will give them low grades. 3. Expert Power is the perception that one possesses superior skills or knowledge. Example: The teacher showed to his students that he has a mastery of the subject matter and he knows a lot about it. The students will feel that their teacher is an expert on that particular lesson. 4. Informational Power is where a person possesses needed or wanted information. This is a short-term power that doesn't necessarily influence or build credibility. Example: There's an electrical problem in the school and it needs a quick-fix.Teacher B knows something about electrical wiring. He is now possessing Informational Power because he can use that particular information on that situation. However, that information is only applicable at that moment only. 5. Reward Power is where a person motivates others by offering raises, promotions, and awards. Example: Teacher C is giving chocolates to the pupil who participates in the class. 6. Connection Power is where a person attains influence by gaining favor or simply acquaintance with a powerful person. This power is all about networking. Example: The new applicant was easily hired because the principal is his uncle. 7. Referent Power is the ability to convey a sense of personal acceptance or approval. It is held by people with charisma, integrity, and other positive qualities. It is the most valuable type of power. Example: Teacher D maintains his role as a positive role model to his students. His students idolized him more because of his influence.